Kirsan Ilyumzhinov, who denies announcements from FIDE that he resigned as president, said that the FIDE Presidential Board planned for 10th April would cost too much, up to 200,000 EUR. In a statement for TASS, Ilyumzhinov repeated: "I did not write any statement and did not sign any papers, therefore I continue my work. I continue to work hard until the next elections in 2018. I do not get involved in intrigues, although Makropoulos and a group of friends try to drag me in." Ilyumzhinov says there is no need to hold the Board on 10th April: "The organization of the Presidential Board will cost FIDE 100-200 thousand EUR. I am certain it is better to direct these funds for the development of chess. But I do not intend to leave my post ahead of schedule," Ilyumzhinov concluded. 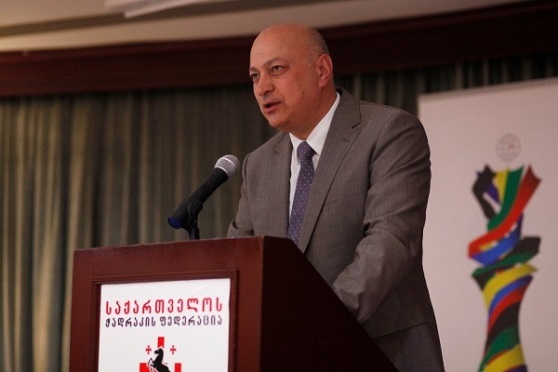 Makropoulos: "Kirsan, it's only your fault"
FIDE Deputy President Georgios Makropoulos said on Wednesday that FIDE President Kirsan Ilyumzhinov should blame himself over the recent media buzz regarding his alleged resignation. 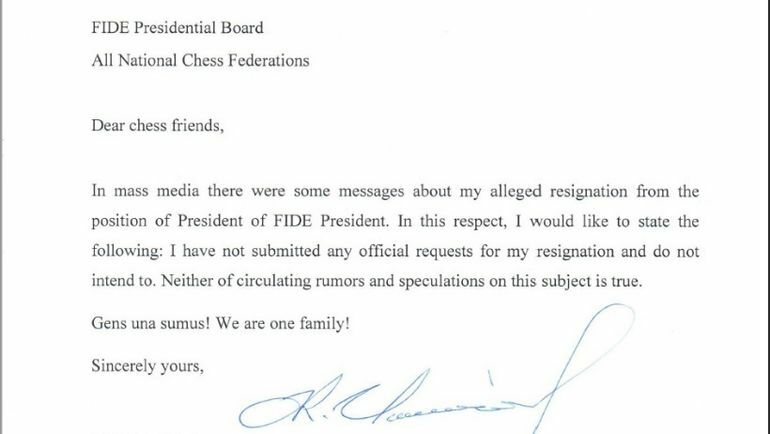 On Monday, FIDE’s official website posted a statement on President Kirsan Ilyumzhinov’s supposed resignation. It stated that FIDE’s president supposedly announced his decision to step down at a meeting of the organization’s council in Athens on March 26. However, Ilyumzhinov rejected this report while talking to TASS. 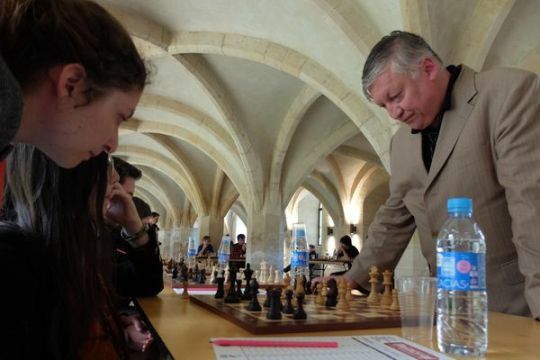 In a letter posted on the FIDE official website and addressed personally to Ilyumzhinov, Makropoulos said: "I would like to kindly remind you that this situation is a result of your own actions." 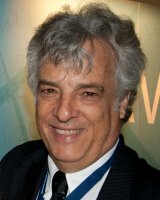 "You were advised before and during the meeting, by several board members present that the discussion was wrong, and that the FIDE presidential Board should not serve for you to try to resolve personal issues," Makropoulos said. "I would not like to speak publicly about the situation with Ilyumzhinov, but I can say that FIDE has big problems because of the sanction against Mr. Ilyumzhinov. This leads to such consequences." 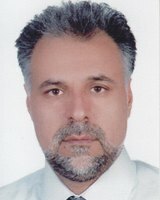 "I think that this is the mistake of those who maintain the official FIDE website. This information is inconsistent and can not be true, since it is not the FIDE presidential board that decides on the resignation of the president, but the FIDE assembly. This is a serious question, which belongs to the general assembly with about 200 delegates." It should be added that Iran still hasn't paid the prize fund for the recent Women's World Championship, and that FIDE had issued a two-weeks notice. "The situation turns out to be very ugly and incomprehensible. 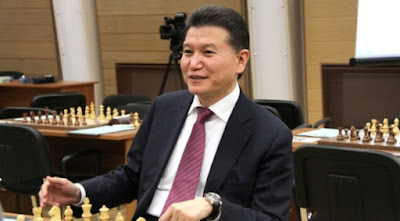 At the FIDE presidential board Kirsan Ilyumzhinov indeed declared, twice before the meeting and once at the very end, about his possible resignation. He said that if necessary he is ready to resign, but there is no written confirmation of this, and this makes for an incomprehensible situation. " "The situation can be clarified only by Ilyumzhinov himself. Kirsan has problems with sanctions and the financial situation is not easy," Kutin added. The press secretary of the Russian president Vladimir Putin and head of the Russian chess federation Supervisory Board, Dmitry Peskov, believes that the current president of the World Chess Federation (FIDE), Kirsan Ilyumzhinov, effectively performs his duties and must retain the post of the president of the federation. "Ilyumzhinov should remain head of FIDE until the time for re-election. We do not believe that there are now grounds for early dismissal. Moreover, we see that, despite the sanctions that apply to him, he is very effective in fulfilling his duties. We support him and believe that he must remain at his post", - RIA Novosti quoted Peskov. Sjakk-OL (Chess Olympiad Tromso 2014) is in the final stages of summarizing the accounts and reports before the company is closed by the end of February. iTromso writes that the company will report to the Norwegian Ministry of Culture, municipalities and counties, and the entire archive will be handed to Tromso Municipal Archives. The preliminary accounts show that Chess Olympiad Tromso 2014 recorded an overall deficit of 4,1 million NOK (474,000 EUR), approximately 3 percent of the total budget for the event. The state was by far the biggest financial contributor to the event, with around 87 million NOK (10 million EUR).